Assistant Professor of Law Amy Hardberger does not remember a time when she wasn’t obsessed with water. 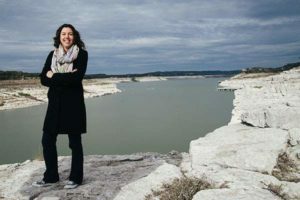 While most city dwellers have grown so used to turning on the tap that they rarely give it a second thought, Amy Hardberger’s love of water first led her to become a hydrogeologist and then an assistant professor at the St. Mary’s University School of Law specializing in water law and policy. In addition to her teaching duties, she relentlessly advocates for creating a dialogue around water issues that affect us all, such as calling for answers to tough questions on affordability and water demand surrounding the San Antonio Water System’s $3.4 billion Vista Ridge pipeline project. Last fall, San Antonio’s city council members voted in favor of the project, which aims to deliver water from the Carrizo-Wilcox Aquifer in Burleson County to a burgeoning San Antonio populace. Because all humans require water, some countries have begun to think of the right to water as a human rights issue, Hardberger said. Some countries, such as India and South Africa, have gone so far as to add the right to water to their constitutions, though the results have been mixed, she said. In the United States, the conversation about water as a human right has evolved more subtly. Hardberger sees it in low income relief programs that help those who can’t afford to pay their bills and in the efforts by utility systems and others to ensure drinkable water reaches colonias along the border. “San Antonio has been, in many ways, the laboratory for Texas water, particularly groundwater,” said Hardberger, who highlights the Edwards Aquifer Recovery Implementation Program, whose stakeholders engaged in conversation to create a workable conservation plan. She said the rule of the majority does not work when faced with complex water issues. Viewing the shrunken volume of Medina Lake, it’s evident why the discussion of water must continue in the classroom and beyond. Asking students what communities hope to achieve with water laws sets the stage for evaluating whether the statutes really work to reach those goals.